The purpose of the problem analysis phase is threefold. First and foremost, the project team must gain an appropriate understanding of the business problem domain. Second, we need to answer the question, “Are these problems (opportunities and directives) worth solving”? Finally, we need to determine if the system is worth developing. The problem analysis phase provides the systems analyst and project team with a more thorough understanding of the problems, opportunities, and/or directives that triggered the project. In the process, they frequently uncover new problems and opportunities. In this milestone you will perform Cause-Effect Analysis on the Equipment Check-Out System (ECS) and document your findings using the Problems, Opportunities, Objectives, and Constraints Matrix. The PIECES framework, originally developed by James Wetherbe and then adapted by the authors, can serve as a useful tool to classify the various problems, opportunities, and directives identified in Milestone 1. •	Perform a Cause-Effect Analysis to be able to thoroughly understand a system’s problems, opportunities, and/or directives that triggered the project. •	Use and understand the PIECES framework for classifying problems, opportunities, and directives. •	Complete the Problems, Opportunities, Objectives, and Constraints Matrix. •	Complete the List of Business Activities based on Requirement analysis. Now that we have completed the preliminary investigation of the system and gained approval to proceed, we can attempt to gain a better understanding of the current system. In this assignment we will use our results of Milestone 1, plus the Case background information and the user interview, in order to perform cause-effect analysis. The results of this activity will provide us a better understanding of the problems, opportunities, and constraints of the current system. 1. To complete the Problems, Opportunities, Objectives, and Constraints Matrix, using the interview and facts presented in this milestone. Use the PIECES framework as a model to classify the problems, opportunities, and directives. 2. 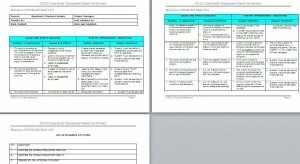 To compile a List of business activities based on business requirements. It has to include the main tasks which have to be implemented. Deliverable format and software to be used are according to your instructor’s specifications. Deliverables should be neatly packaged in a binder, separated with a tab divider labeled “Milestone 2”. Write a System Improvement Objectives and Recommendations Report for the phase. This deliverable was not discussed in the narrative because students need to be exposed to modeling (data, process, & interface), before this report can be completed. For those ambitious individuals who are familiar with those skills and wish to be challenged, use the detailed study report outline found in Chapter 5 of the textbook, as a guideline. Another advanced option is to develop one or more fishbone diagrams for problems outlined in the case. To complete this advanced option, you may need to make some assumptions about causes and effects. The following is a transcript of an interview between Dan Stantz’s staff and you, a systems analyst from Information Systems Services (ISS). Your goal for this initial interview is to obtain facts about the problems and opportunities that have triggered the Equipment Check-Out project request, plus other general information that could help prepare the Problems, Opportunities, Objectives, and Constraints Matrix. Scene: The Equipment Depot. You have scheduled to meet with the Equipment Depot staff just after the 3:00 PM shift change when Oscar Barrett finishes work and Janine Peck starts her shift. S.P. Marsh, the third shift employee has agreed to come in for the meeting. You are sitting on stools behind the counter. for the day. I’m especially sorry S.P. had to make a special trip in. each of you in on the project that I am working on? S.P. : Yes, Dan told us. (The others nod.) We certainly need the help. out earlier in the day? Janine: And some were both checking in and checking out. two – equipment check-in, and a check-out. S.P. : For one thing, I periodically receive an employee hiring notice from a supervisor. alphabetically insert the form into the notebook. S.P. : Let me clear it with Dan first. But I don’t see why not. requires me to update an employee’s registration form. S.P. : And of course, the supervisor will provide us with employee termination notices. employee has in his or her possession and communicate that to the supervisor. Employees who are quitting usually check in their equipment on their last day. But if they are fired, we rely upon the supervisor to get the equipment and check it in to us. They tend to not be very prompt and reliable in doing that. Janine: Now S.P., let’s not do any finger pointing. S.P. : Sorry, but it is true. You: What else do you folks process? Janine: When employees aren’t here turning in equipment, I am frequently busy with ordering new equipment. You: What triggers or initiates the need to order new equipment? initiate a request when an employee reports losing a tool. of us are authorized to buy anything they have as long as we don’t go over budget. You: So this equipmentdeals.com is the cheapest? You: So this new system doesn’t have to do anything with purchasing? wanted it so he or she can check it out. Right now we keep a log with information, but it doesn’t work very well. You: Okay. I’ll see what I can do about that. lost, we record the cost on the original check-out sheet so we have a record of it. check-in and check-out forms to match them with the employee is too tedious. You: Can’t you match them by serial number or something? worth tracking individually. A drill is a drill. You: So how do you match up a found drill with a lost drill? missing, such as a drill or router. You: What else do you do? record of the employee who caused the damage. You: So you track repair costs and lost equipment costs by employee? all those records that manually. Maybe you can build that into your system. you maintain. Can you tell me a little about them? I saw the employee notebooks. Are there others you can tell me about? Janine: I can’t think of anything that wasn’t already mentioned. the topic of reports. Do you generate any reports? to have a year-end inventory report. Janine: Yeah, and a report of all checked-out equipment, by employee. expected to have in their possession. excessive equipment losses or damage. any ability to quickly obtain reports or information that we need to do our job. next few weeks to learn even more details about your current checkout operations. But I see we are out of time. So thanks again for permitting me to meet with you. Hi. did you solved this milestone after reading the case study. Just to let you know i have got full score with the milestone 1 I purchased from you. Thanks man. thank you man. the lab was great. exactly what i needed.